Yoga improves overall strength and, although there are many varieties, as you continue and progress in your practice, strength plays a key role in performing all poses properly. Yoga teaches you to concentrate on only your practice and the movements at that exact moment. To be detached from all stresses and material distractions and to focus on the importance and simplicity of each moment is a skill that can be applied to improve focus in any situation. Practicing yoga fosters a sense of self-awareness and inner fire. Yoga is a practice of breath first. With proper breathing, you are able to reach deeper into a pose and will get the most out of your practice. Yoga breath comes in many forms: cleansing, balancing, and heat, to name a few. These all help reduce stress and improve balance, providing a sense of internal cleansing. Yoga perfectly compliments a strength training routine. It helps stretch out muscles and reduces lactic acid build up which, in turn, reduces muscle soreness. Implementing yoga into your weekly routine increases your flexibility. Increased flexibility is an asset to any fit lifestyle. You will be able to dig deeper into an exercise while holding proper form and will reduce the risk of injury from performing all daily acts, whether they include playing with your pup or finishing a set of heavy deadlifts! Practicing yoga helps with muscle imbalances, creating a platform for balanced muscle growth. Perform the practice without force or stress on the body and only do what feels right or what your body needs that day. Sometimes less is more; easing off of a pose is absolutely okay. We are conditioned to think that causing stress on our bodies is production. With yoga, it is the exact opposite. At no point in your practice should you feel stressed. You should feel at ease from start to finish. Have you ever heard of the Yoga Glow? Yoga helps clear and purify your mind, heart, and body. The fiery breath and twisting poses help cleanse your internal organs. Pure, clean, relaxed, and glowing looks good on everyone! All you need is you and your mat! In your basement, in the gym, in your backyard, in the park, or on the sand… wherever and whenever you decide to practice, you can squeeze in a quick session or lose yourself in a sequence of poses for hours. Not only does increased flexibility enhance your performance between the sheets, but yoga improves mood, blood flow, and energy! The benefits of yoga can always be enjoyed, whether you are a first timer, advanced yogi, young, old, athletic, or a bookworm! 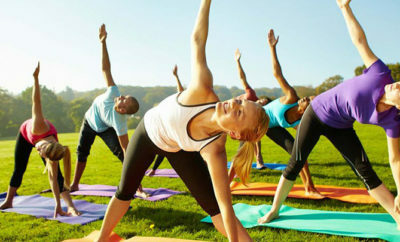 Yoga can benefit performance in a professional sport or help you live your best and fullest life, whatever that may be. It is a sport that can stay with you from youth to elder and can be enjoyed with generations present and future! Give yoga a chance to benefit your lifestyle. You will be so happy you did! ← Previous Story Dine In A Dash: Four Dinner Recipes to Make NOW!